The Howler Monkey, as the name suggests, is known for its excessively loud howl, particularly when protecting its territory. They are monkeys, who despite their size, are not very heavy, allowing them to move through and hang from trees with ease. This species is found in regions of Central America and South America where tropical conditions are present. Read the below facts and information on Howler Monkeys and you will see what makes this animal so interesting including why they seldom set foot on the ground. This information is written for both kids and adults. Click here for a great selection of Amazon.com books about Howler Monkeys. The majority of the Howler Monkeys time is spent relaxing. In fact they are said to be among the least active of all monkeys. They can live to be approximately 20 years old. The biggest, strongest male usually leads a troop of 15-20 other Howlers which includes males, females and babies. Howler Monkeys like to spend time grooming each other both for enjoyment and closeness and to rid each other of unwanted dirt and insects. Because the Howler Monkeys feed mostly on leaves, flowers and fruit, they need an area with enough of these resources to feed the entire troop. This monkeys howls can actually be heard through the dense South American forest from three miles (five kilometers) away. The noisy howls make the Howler Monkey the loudest New World animal (animals native to the Western Hemisphere) living on land. The males use their howls to defend and protect their territory. Although howls take place at various times throughout the day, the morning and the evening is prime time for sending the message to others that the area is already occupied. The distinctive howl aids them in the thick South American forest where vision is limited and sound travels well. New World Howler Monkeys (native to the Western Hemisphere) differ from Old World monkeys (native to Africa, Arabia or Asia) in that there are no sitting pads on their rear ends to cushion them. Howler Monkeys have a tail that has been adapted for use as another arm, called a prehensile tail. They use this tail to grip onto tree branches. It also allows them to hang while using their arms to gather leaves to eat. 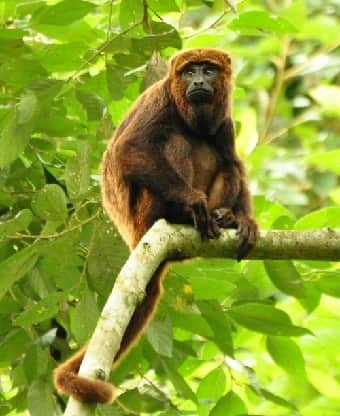 Their body hair is long and course and can be brown, black or red depending on the gender and specific species of Howler Monkey. Howler Monkeys are the largest New World monkeys. They range in size from 56 to 92 cm (22 to 36 in) but their tail length can be an additional 58 to 92 cm (23-36 in). They typically weigh between 3.6 and 9.9 kilograms (8- 22 pounds).